This digest-sized book offers all the core essentials for playing Slasher Flick. It contains not just the rules, but also a thorough examination of the genre, player/Director advice and much more. 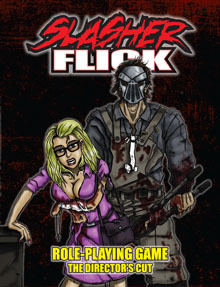 Slasher Flick: the Director's Cut is more than just a cute play on words... it's a deluxe version of the Slasher Flick core rulebook. It contains everything that the standard rulebook contains, as well as the material from Casting Call, Deleted Scenes and Special Features. Plus, it offers a full-length adventure and three mini-adventures. You'll find 100 ready-to-butcher characters that can be used as primary, secondary or tertiary characters. Also included is a section that tells you how to quickly customize the pre-generated characters to better fit your gaming needs. • Available in PDF • All of this material is included in The Director's Cut! This mini-supplement offers Slasher Flick fans some new material, such as: character-versus-character combat, weapon rules, Performance Points, new special abilities, sample items and more ways for the Director to embrace the genre. • Available in PDF • Some of this material is included in The Director's Cut! 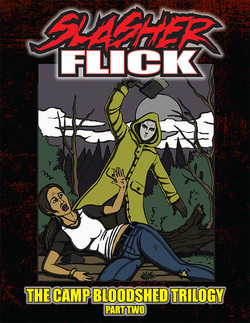 Special Features offers new material for the Slasher Flick RPG, including: a complete list of special abilities and their effects (including some brand new special abilities too), random character creation rules, advice for integrating "corpse scenes", group templates and three pre-made killers (complete with several plot ideas for them). No-Frill Chills is a line of Slasher Flick supplements that foregoes all the non-essentials in order to provide you with as much bang for your buck as possible. This installment of No-Frill Chills presents you and your group with an entire "Main Street USA" type of town, complete with details on more than two dozen locales, stats for numerous denizens, three fleshed out premises for flicks and loads of ideas for other flicks throughout the text. 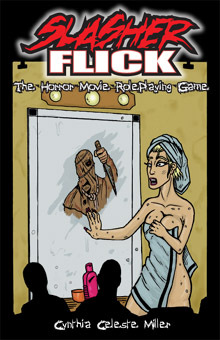 This mini-supplement presents rules and advice for playing Slasher Flick with particularly large groups without bogging the game down or adding needless chaos. These eight inserts can be slid into a customizable landscape-oriented GM screen or printed directly onto cardstock to create a dedicated stand-alone screen. In addition to the PDF offering, the inserts are also available printed on very sturdy cardstock. When added to the cart, you will be given the option to also include a customizable, plastic GM screen. When a group of young adults travel to a supposedly deserted island for some fun and partying, they find out that the island is anything but deserted. Someone or something is watching their every move and starts killing them off one by one. This flick puts the players in the role of ghost hunters investigating a long-since abandoned hotel that was once very opulent. But when they start getting picked off, the remaining characters have to figure out who - or what - is responsible. Will they escape with their lives intact or will they become the latest victims of the hotel? This adventure was designed to be played multiple times without it ever being the same, thanks to a myriad of options and alterations for the Director to employ. When a gang of old college friends get together for a reunion at a sprawling mansion, they quickly find that they are not alone. Someone -- or something -- is watching them... waiting for the opportunity to kill them. Can they survive the night without losing their heads? No-Frill Chills is a line of Slasher Flick supplements that foregoes all the non-essentials in order to provide you with as much bang for your buck as possible. This installment, the hapless crew of a deep-space haulage vessel picks up a drifting pod. Little do they know that this will prove to be the worst decision they've ever made... and possibly their last decision as well. Camp Bastion is ready for its grand opening. Everything is in place -- the counselors are there, fun activities are planned and the campers have just arrived. Oh, and there's a deranged killer on the loose. Everyone at the site is in grave danger as they are stalked and picked off, one by one. Who will survive? Why has this relentless psycho descended upon the camp? How can he be stopped? 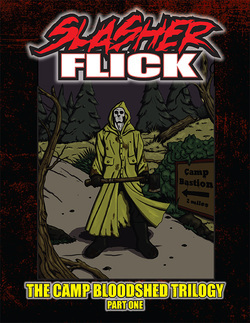 The Camp Bloodshed Trilogy (Part One) is the first of three flicks (aka adventures) that collectively represent a trilogy of movies. It all begins right here! And wait 'til you see the "twist" ending! The sequel to the top-selling Slasher Flick adventure of all time! It takes place 24 years after the events of the first installment. Since that time, the massacre at Camp Bastion has faded into the realm of local legend and now, the brothers and sisters of a fraternity and sorority are forcing their new pledges to spend the night at the infamous camp. Will they survive the night or will history repeat itself? The Camp Bloodshed Trilogy (Part Two) is the second of three flicks (aka adventures) that collectively represent a trilogy of movies. The gory thrills continue right here, so prepare yourself for all the twists and turns to come. This book collects Casting Call, Horror Island, Deleted Scenes and Special Features into one digest-sized print product.